If you need a pet carpet cleaning service in Tampa FL consider Chem-Dry of Tampa. We have years of experience removing pet remnants from carpet. 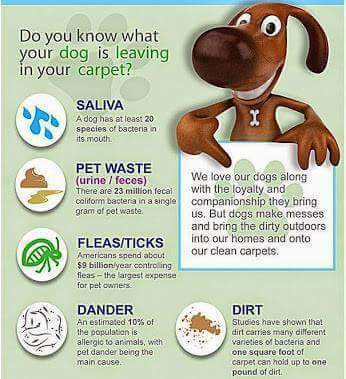 Whether it's saliva, Fleas, dirt, dander, or the dreaded urine deposit. Our pets have a way of bringing the outdoors indoors. In Tampa FL pets bring in a lot of sand. There is sand everywhere you go. Pets track it in on the their paws and in their fur. It's completely unavoidable. After cleaning hundreds of homes I can tell you that pets contribute the most soil to our carpets and furniture. No matter how much we wipe their feet when they come inside the hair on the bottom of their paws will bring in a lot of soil that easily transfers to the carpet and upholstery. My dog food and water bowls are on a carpeted area in my home and even with constant clean up those areas are always getting dirty. To own a pet you have to be willing to accept some level of soiling that comes along with them. For pet lovers it's pretty easy to overlook in a trade for the constant affection and lack of judgement we get from our pets. As a customer told me the other day if he locked his dog and his wife in the garage for three hours only one of them would be happy to see him when he let them out. By the way I don't recommend testing that theory. The good news is you can accept your pet without having to accept the dirty carpets or upholstery that comes with them. Chem-Dry of Tampa's pet carpet cleaning services can handle all your pet related carpet issues without all the long dry times that are usually associated with steam cleaning your carpet. For pet carpet cleaning services in Tampa FL call Chem-Dry of Tampa.